You are here: Home / Breastfeeding and postpartum care / Breast is best. Ideally. There are a number of reasons that breastfeeding may not be possible, including poor milk production, difficulty latching, ongoing infections.. to name just a few. There is also the matter of personal choice – some women just aren’t into it. All of which is absolutely fine of course – if you can’t, you can’t. No sweat. However, if you can and wish to, you should. Why? Well for starters, see how nice it looks! … ok, so things aren’t always this pretty. Nonetheless, breastfeeding is a beautiful thing. Breast milk is THE best formula for a baby. Obviously, that’s who it’s purpose designed for! You simply cannot manufacture an equivalent, certainly not with the same balance of specific and digestible nutrients. Some formulas may come close, but they still aren’t the same. Breast milk also supports the development of a strong and healthy immune system in these brand-new humans. It is rich in immunoglobulins, B-cells, T-cells, neutrophils, macrophages and antibodies – all of which play an integral role in growing healthy, bouncing babies. A mum’s breast milk will also change as her baby ages, naturally adapting to the different requirements with each new stage of growth and development. Bespoke… more or less. There will always be as much as bub needs – as the baby grows bigger and needs to drink more, milk production will increase. The same applies in reverse for weaning – as the baby starts to feed less, milk production will decrease. 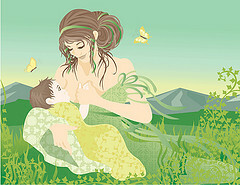 There is also the fact that breastfeeding is one of the most important bonding acts between a mother and child. I’m not saying that babies who aren’t breastfed don’t bond with their mothers (I wouldn’t dare), but the process is singularly nurturing – for both mum and baby. For many women, breastfeeding doesn’t happen easily. In fact, some new mums feel quite the opposite of ‘natural’ to begin with – it can be really hard! – this can be for any number of reasons. Happily, in the majority of cases these hurdles can be overcome. Don’t be afraid to ask for help as soon as it feels like things aren’t flowing – talk to your midwife, nurse or lactation consultant. They are there to provide support and advice at precisely this time in a woman’s life. Seriously, take advantage of it. Simple dietary changes can have a big impact e.g. making sure mum’s eating and drinking enough – interesting how often these things get forgotten when there’s a new baby to look after! Nutritional supplementation, particularly when there’s a clear deficiency e.g. iron and essential fatty acids. Herbal medicine can be used to aid a timely recovery from labour and birth; help with energy, which is almost always in deficit; soothe tired, cranky and/or colicky babies (and their parents); not to mention improve the flow of milk. Impressive, no? Ultimately, breastfeeding is a matter of individual choice. So, please, do what feels right for you. Caveat: also please, make an informed choice – talk to other mothers, midwives and lactation consultants about their experience; and take some time to read-up on the risks and benefits. There is good reason for the WHO to recommend exclusive breastfeeding for the first six months of life, then combined with appropriate food introduction, until at least two years of age. Think about it.